2:22 PMAll right, kiddos. Big day here at All Day. I’ll be making my debut on Around The Horn on Wednesday at 5 p.m. on ESPN. That would make your boy the 36th panelist in show history, which, heck, I’m proud of. Tune in. "The law" it's not always just. Often it [the law] supports systemic injustice. So I don't care about "lawful" I care about what's right. If it ain’t one thing, it’s another. That’s what my mom used to always say, and when it comes to hurricanes, that’s how many Americans feel now. While rescue efforts are clearly still very much underway in Texas regarding Hurricane Harvey, evacuation procedures are underway down in Florida now that it looks like Hurricane Irma is going to touch down soon. It’s also expected to bowl through Puerto Rico and the Caribbean, and already the NFL has moved a game off its schedule from this week to accommodate the storm. Good luck, all. Over the past few months, we’ve heard it asked where’s Obama? While President Donald Trump has done his best to dismantle nearly everything his predecessor did, albeit not with very much tact or success, a lot of people feel like they should have been hearing more from 44 about his legacy. Well, for one, he certainly doesn’t owe us anything at this point. He gave more than enough time and energy to this country, so he can definitely chill. But he did have something to say about the repeal of Deferred Action for Childhood Arrivals, and it was quite a bit, at that. The utility of a fanny pack is obvious. A bag that you can carry around your waist that keeps your valuables, all while your hands and arms stay free from accessories. A belt with a pocket. And while they were all the rage 25 years ago, until the suburban parent and tourist crowd took over the whole swag, some people say they’re making a comeback. Various high-end retailers and streetwear companies are coming out with modified versions of these things, including Supreme, which means, yeah, they’re back. Michael Bennett is not the one to mess with. The outspoken NFL player has been extremely vocal about his feelings regarding what it’s like to be black in America and has never shied away from a conversation about the matter. He’s been right with Colin Kaepernick all along the way, but the latest incident he experienced has caused him to take action. 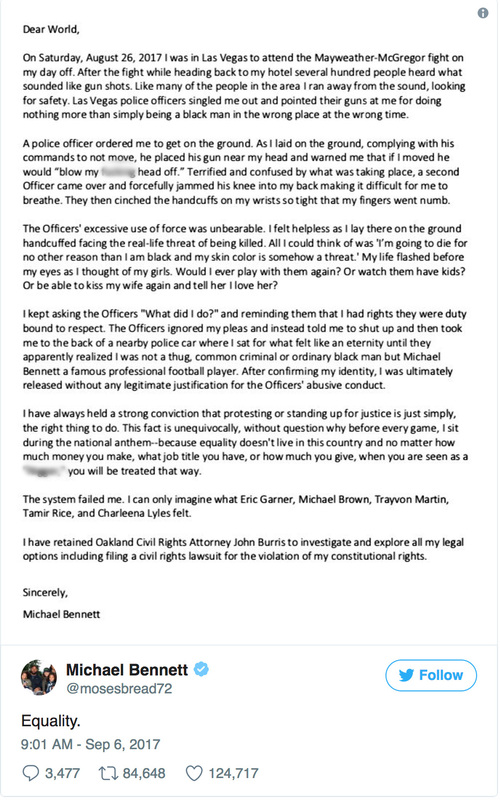 In a long letter posted on Twitter, Bennett described a situation in which he felt he might lose his life at the hands of an officer for no reason. He plans on suing. The video is tough to watch. Coffee Break: The fashion industry is known for how difficult it can be to break through the ranks if you don’t fit a certain look, style, body type or whatever. Even as people become more accepting globally, the industry itself remains extremely rigid. This convo with a group of them about exclusion is worth your time. Snack Time: ALERT — we have a trailer for The Magic School Bus. Please inform all young parents who are looking to simultaneously relive their childhoods and teach their kids at the same time. Dessert: I know it feels like dystopia. But this list of flicks about that life is actually quite fascinating.